Lock in a great price for Alhambra Palace - rated 8.9 by recent guests. Views amazing, room comfortable, friendly staff, amazing food. The breakfast was reasonable, but relatively expensive for what it was. The location and views were fabulous. Everything. Terrific location. First class hotel in every way. Excellent service, facilities, staff, meals and rooms five star standard. Great bar/cocktail area overlooking Granada in valley below. Very relaxing and felt very spoilt. Highly recommended. The location, the atmosphere and decor of the hotel was marvellous. Staff super attentive. Great view！ Free champagne for our honeymoon! Real wonderful hotel! Recommend! The reception changed my room with city view by charging reasonably more money and it’s well deserved! The view is just fantastic! If you want to avoid the hustle and bustle in downtown, this is definitely your place. And it’s just about few minutes walk from Alhambra, so I took the advantage doing a midnight exploration around the castle, and it’s fun (although thrilling, I am talking about the temperature:)! 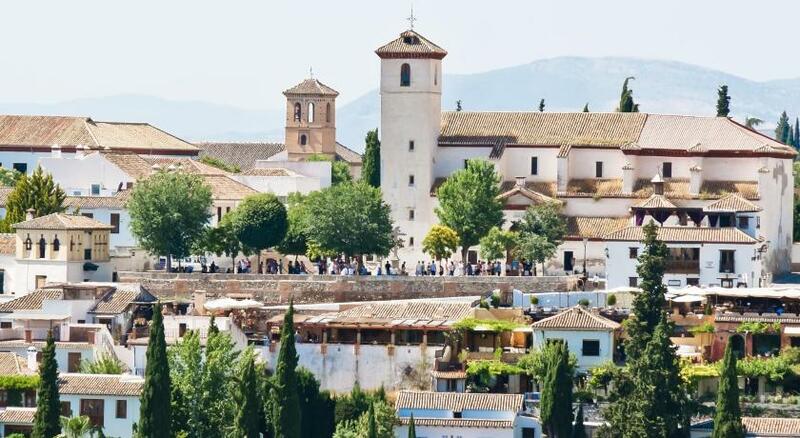 One of our top picks in Granada.Alhambra Palace is located just outside the Alhambra’s ancient walls, offering spectacular views over the city of Granada. It features stylish rooms with Moorish-inspired décor, free Wi-Fi and satellite TV. The hotel’s à la carte restaurant serves Mediterranean and International food. There is also a bar with a terrace boasting impressive views of Granada and Sierra Nevada. The Hotel Alhambra Palace’s front desk is open 24 hours a day, allowing you greater flexibility during your stay. There is an on-site cash machine, as well as a currency exchange service. The hotel offers parking with valet service for an extra charge. A bus stop directly opposite the hotel will take guests to the Alhambra or city centre. You can walk to the Alhambra itself in under 10 minutes, through a small wooded area. It is a 10-minute walk to the UNESCO World Heritage site of Albayzín, the medieval Moorish quarter. Alhambra Palace has been welcoming Booking.com guests since 2 Nov 2000. 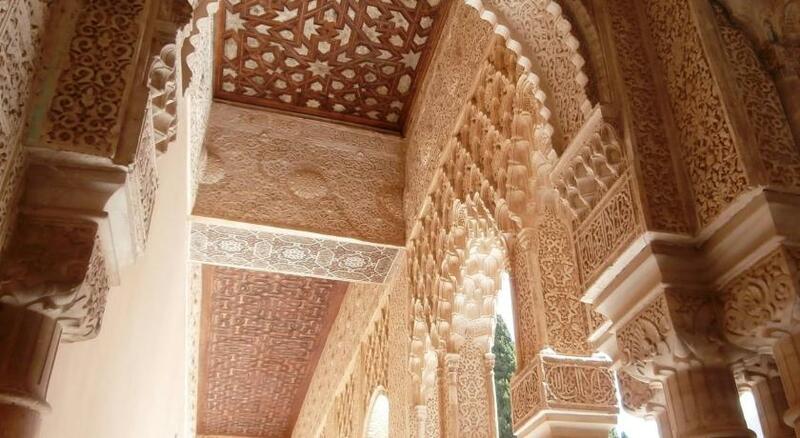 When would you like to stay at Alhambra Palace? This air-conditioned room with free Wi-Fi includes satellite TV and a minibar. Some of these rooms offer views of the city, mountains, or Alhambra Forest. Private parking is possible at a location nearby (reservation is needed) and costs EUR 20 per day. This air-conditioned room with free WiFi includes satellite TV and a minibar. It offers views of the mountains or the Alhambra´s forests. This air-conditioned room with free Wi-Fi offers city views and views of Sierra Nevada Mountain Range, satellite TV and a minibar. This air-conditioned room features views of the Alhambra's surroundings. It includes a flat-screen TV and a minibar. Free WiFi is available. This spacious air-conditioned room features views of the city. It includes a flat-screen TV, minibar, and free WiFi. Featuring views of the Alhambra Forest, this room has wooden floors, marble bathrooms with free toiletries and exempt bathtub. It includes automatic slatted shutters, night lighting, individual air conditioning, WiFi, cable TV, minibar, safety box and telephone in the bathroom. Living History in tourism since 1910. Culture, pleasure, elegance and aristocracy coexist in this centenary hotel, pioneer of tourism in Andalusia and Spain. House rules Alhambra Palace takes special requests - add in the next step! Alhambra Palace accepts these cards and reserves the right to temporarily hold an amount prior to arrival. Helpfull staff, Good location near Alhambra Palace. The over whole state of the hotel is far from how a 5* Palace should be maintained. Old unmaintained and dusty was the room.